This post was originally published on BuzzFeed. Click here to view it. Over 10,000 views wooo hooo! This news interview was originally aired on Charlottesville’s CBS19 station. To view the full clip click here. This content was originally published on the Blog of The Albert and Shirley Small Special Collections Library at the University of Virginia. To view the full text please click here. This semester I have had the honor of being a guest blogger for the Albert and Shirley Small Special Collections Library at UVA. As the posts become available, I will repost them to this website. 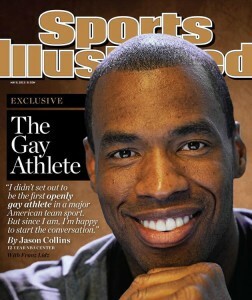 After the news of Jason Collins’s sexual orientation hit the press yesterday, an enormous amount of commentary, both anonymous and not, emerged on the digital sphere. While most of these comments were positive, gathering support from notables including Kobe Bryant and President Obama, some was not. This is harped on well in the New York Times article, “Inside N.B.A. and Out, Words of Support (Mostly) for Collins’s Revelation”. In which, authors Ben Hoffman and Christine Haughney, discuss how there were some who actually expressed strong discontentment with the news and homosexuality as a whole. What is important to note about these though, is that for the most part the negative comments were anonymous. Even though they cite the example of Mike Wallace, a wide receiver for the Miami Dolphins who tweeted in a somewhat peevish tone about the matter, it is also noted that he attempted to retract and delete his negative statements within hours. Because he was likely bombarded with disapproving criticism after his initial statements of intolerance, he was inevitably swayed to delete them and issue an apology. In short, this is testament to the argument against cyber anonymity. While theorists like Nancy Baym, Dannah Boyd, and Rebecca MacKinnon – argue that lack of identity online allows people to speak more honestly and that anonymity is crucial for political activism/sustained democracy – they are strongly counteracted by a plethora of examples of users rather wielding anonymity as a shield in order to convey hateful messages, messages that would otherwise have gone unsaid if a name were attached. Besides from the overabundance of anonymous hate comments towards Jason Collins at the bottom of articles about his outing, another good example of this is on the People of Wal-Mart website. Lisa Woolfork, a UVA professor and expert on the subject, illustrated how these simple images can generate hundreds of distasteful comments that are only being said under the pretenses of remaining unknown. This reality of anonymity masking hate speech has been one of the driving forces in Zuckerberg’s goal of adding accountability to the online world through facebook. In his letter to the investors he makes brief mention of his goal to rid the web of unnecessary anonymity that can provoke trolling and abuse. This is exemplified in sites that now require readers to connect with facebook before a comment can be made. While these scholars present the two opposing sides of Internet anonymity, it is important to recognize the validity of both while moving forward. Certainly as the aforementioned female scholars have noted – anonymity is crucial towards revealing true sentiments and engaging politically. But at the same time this same anonymity can often be abused for distasteful expression. Perhaps a proper solution would promote anonymity coupled with a form of monitoring – either laterally or hierarchically – but that is a debate for another time. 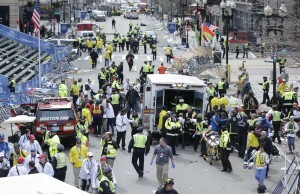 When tragedy struck at the Boston Marathon on April 15th, the regular every day person was the first one on the scene. The actions ranged from rescuing others, to tweeting about the incident, and even acting as the primary news outlets equipped with smart-phone video cameras. This mass amateurization was only perpetuated as the manhunt for the suspects was taken into the hands of people everywhere. Granted, this crowd sourcing approach was somewhat unsuccessful in identifying the Tsarneav brothers, however the underlying ideal for the public to mobilize in response to a tragedy like this remains. This response was a clear example of concepts discussed by Internet scholars including Clay Shirky and Siva Vaidhyanathan. In Shirky’s book, Here Comes Everybody, he notes the wonderful capabilities that mobile technologies bring including civilian journalism. Additionally, Vaidhyanathan in his article, “The Technocultural Imagination”, acknowledges how this sort of mobile technology has become the great equalizer and an inhibitor for instant communication. While both appreciate the democratizing capabilities of digital technology, Vaidhyanathan goes on to propose a common concern that these technologies have altered our expectations for prices and immediacy. Although these concerns are not without warrant, the focus of the attention on these subjects in relation to the bombing have been nothing less than heartwarming and idyllic. A recent trend that has swept the social media sphere is the red equal signs that have undoubtedly been in your and everyone else’s newsfeed. These equal signs are a part of a protest to pressure the Supreme Court to recognize gay marriage. But how successful is this campaign? And moreover is there any credibility in the notion that social media can be a tool for real world change? The answer to this question, I would argue, is complicated. 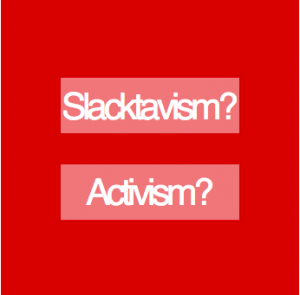 Where on one side, Internet cynics such as Evgeny Morozov dub this type of protest as “slacktavism” – meaning an allusion of contribution followed by no real world action – optimists like Clay Shirky would argue that these movements personify the protest of the modern age. Essentially though, they are both right. To back this claim, I want you to consider two very different social media campaigns – Kony 2012 and the Marriage Equality equal sign. 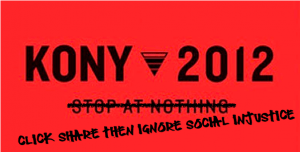 In support of Morozov’s argument, the Kony 2012 movement was a complete failure. Virtually as soon as someone pressed the share button to that viral video, the topic disappeared from discussion altogether – not to mention the overwhelming failure of the proposed paint the town night that was supposed to occur on April 20, 2012. This is a prime example of Internet consumers pretending that they are doing good for the world through digital compliance but then translating it in to absolutely zero real world action. However, the example of the equal sign movement had a much different effect. By simply getting the topic out there, and by showing people how members of their real life social network were in support of gay marriage, it removed carelessness as an option. In other words, in Baym-ish (extension of reality) recognition of real friends and family proudly showing their support for gay marriage people could no longer abstain from the issue. As a result, people inevitably realized that they too supported gay marriage and more pressure was put on the Supreme Court to vote in recognition of marriage equality. Because Kony 2012 presented a problem without an adequate or appropriate plan of action to get a solution it ultimately failed. On the other hand though, by just generating enough attention the Equal Sign movement forced many people whom would have otherwise preferred to stay unopinionated on the subject to pick a side – and inevitably this made a difference. So long as these digital social movements have a clear and realistic plan of action for accomplishing their goals, these movements can indeed be successful. During this delightful time of year when every college student is busy beyond belief, or perhaps on the brink of collapse after pulling an all nighter for the three midterms that he had in one day, there has been a digital trend that has brought amusement to this abundance of library inhabitants – digging up old stuff. Because of the immense procrastination occurring at the collegiate level, many students have turned to the past to find sources of amusement. For example, a video that I made my junior year in high school has suddenly resurfaced. It has been on my facebook page this whole time, yet until now it has gone practically unnoticed. It went from having 7 likes on Monday to 161 likes on Thursday. This is just one example though, as more and more profile pictures from the eighth grade are riddling the college student’s news feed – oh my how people have changed! Not only is this content somewhat hilarious when it is someone else and embarrassing when it is you, but it also hits on some of the ideas that Nancy Baym and Dannah Boyd talk about in their works. Boyd’s article “Social Network Sites: Public, Private, or What?” outlines how the four properties of persistence, searchability, replicability, and invisible audiences make mediated publics different than reality. Her term of persistence is exactly what has happened with this trend. Just like she said, something that I posted while in high school is still accessible today. Her property of invisible audiences also held truth for me, as I even received a message from one of my high school teachers who enjoyed seeing the video again. Baym reiterates these themes in her book Personal Connections in the Digital Age, as she accredits digital information’s reach to the asynchronous nature of online communication. Overall while this trend is in good fun, it has taught me an important lesson about the persistence of any information posted online. If you are interested in watching the video here is the link. On December 21st, 2012, Facebook launched its newest app entitled “Poke” – but many soon realized that this app was not so different than one already in their pockets. Frankly, Poke was a complete copy of Snapchat – an app that allows you to send photos and videos that self-destruct within a few seconds. While most immediately recognized the sexting potential in both of these apps, the widespread use of Snapchat and now poke suggests that these are more heavily used for entertainment like sending embarrassing selfies to friends. This pervasiveness though is what differentiates the two products. While Snapchat has been around for two and a half years and is now the fourth most popular app in iTunes, Poke has yet to break the top 100. 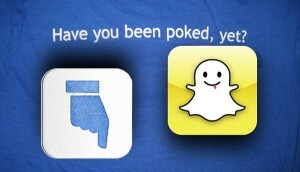 So why then would Facebook launch an app so similar and so unsuccessful? In short, Facebook is attempting to obliterate the competition and assert its dominance among the digital-social platform. Tim Wu, a media theorist, discusses this drive of media empires and how it threatens entrepreneurship in his book The Master Switch. Here he uses the term, the Kronos Effect, to describe how dominating companies will often buy emerging ones in their infancy. Even though in this case Facebook is trying to create a pseudo app in hopes of stealing the market, they also have exhibited this purchasing model of the Kronos Effect when they bought Instagram in 2012. This hunger for power has been somewhat revealing, as it leads users to question the morals of this corporation that they have become so dependent on. Note: all statistics came from this article from Tech Crunch Magazine. If you would have told me five years ago that I would grow up to be a proud gay man who lives in San Francisco, works at Facebook, and teaches yoga on the side.... I probably would have poured a Keystone Light out on your head. • @Facebook / @instagram - I'm so thankful to have the coolest job in the world. You've introduced me the most amazing people and I'm lucky to work somewhere that encourages me to bring my authentic self into the office every day. #PDS19 • @YTTPSF - Thank you for showing me how to be kind to myself. This yoga practice has been such a gift to my life, and getting to pass that gift on to others brought tears to my eyes. This third photo is a picture of me getting mic'd up for my first full class tonight. I couldn't take any photos after because I was low key crying. • Listen to the voice inside you. It's trying to tell you something. Shoot. Did I miss Valentine’s Day?